In the April 1891 Census Waller’s father, Charles Bedingfield, and his mother, Sophia, were living in Tichbourne Street, Leicester. His father was recorded as a commercial traveller and tobacco factor and his mother was working in the family tobacco business as well. (This business reflected their origins in Bristol, at the time a mjor centre for tobacco inporting and manufacturing.) Bedingfield’s younger brother, Ralph Waldo Bedingfield born in 1872, was living with his parents and his occupation was recorded as “Articled Clerk. Architecture”. However, Waller King Bedingfield jnr. does not seem to be recorded anywhere in the Great Britain Censuses, so perhaps he was travelling abroad at the time. In Wright’s 1899 Leicestershire and Rutland Directory “Walter” and Ralph Bedingfield, ARIBA, were listed as living in Miss Emma Prior’s Apartments, 73 Princess Road, Leicester, with “Walter” K. Bedingfield practicing as an Architect at 15 Friar Lane, while his younger brother, R.W. Bedingfield ARIBA was also practicing as an architect in the town, in his case just around the corner in Hotel Street. In 1900 Waller was married in Croydon to Catherine Sarah Britten, born in Worcester in 1873. The 1901 Census misspelt his name again and listed “Walter” and Catherine as living in Leicester Road, Wigston Fields, Leics., and his profession was recorded as “Architect”. Sadly, the marriage did not last long as Catherine died in York in 1902. In the 1908 Kelly’s Leicestershire and Rutland Directory Waller Bedingfield was listed as Hon. Secretary of the Leicester and Leicestershire Society of Architects with an office at 3 Granby Street, and also practicing as an architect and surveyor at 20 Market Street. This was in partnership with the architect and survey William Lawrence Keites and the prominent local architect and architectural historian Thomas Henry Fosbrooke (1862 – 1925), and the three traded as Keites, Fosbrooke and Bedingfield until 1918, and then Fosbrooke and Bedingfield after the retirement of Keites). By 1908 Waller was living at St. Aubin House, Bitteswell Road, Lutterworth, (where he was to live for the remaining 44 years of his life), while his brother Ralph had an architectural practice at 22 Friar Lane. “Cluanbeag”, Glebe Road, Oadby: a large house for Leicester industrialist Duncan Henderson, 1907. Woodgate, Leicester: Hawley & Johnson Dye Works, 1913. Rothley Garden Suburb (developed by the Rothley Temple Trustees ca. 1910 – 1920: pair of semi-detached houses in the Letchworth Garden City/Arts and Crafts style for J W Spurway, 1915, and later a very distinctive “Motor House” addition to the house of J.A. Hilton, including an electricity generating room for charging lead-acid accumulator batteries etc. Bedingfield also led the 1930 excavations of the Leicester Abbey site, including the restoration and layout of the surviving remains. He was also very active in voluntary organisations, as seen for example in his service as Secretary of the Leicester and Leicestershire Society of Architects and as a long-serving Hon. Secretary of the Leicestershire Archaeological and Historical Society. He was also an active county committee member and local representative of the National Society for the Prevention of Cruelty to Children. However, Bedingfield’s lasting monument in relation to his many years of voluntary work is found in the Rotary Club movement both locally and nationally. Rotary was founded in Chicago in 1905 and arrived in Europe with the establishment of Clubs in Dublin, London and Belfast in 1911 and Manchester, Glasgow and Edinburgh in 1912. Early in 1916 Charles Charante, a member of the Rotary Club of Edinburgh, was moved to England by his company to set up a new regional office in Leicester. Having few if any friends or contacts in the town he contacted several prominent local business and professional men and introduced then to the concept and ideals of Rotary. Following this he invited seven of these, among them Bedingfield, to lunch with him and a member of the Edinburgh Club, Thomas Stephenson at the Stag and Pheasant Hotel in Humberstone Gate on 17th March 1916. At the end of the lunch and a talk by Stephenson about the aims and purposes of Rotary those present signed a written statement resolving to form a Rotary Club in Leicester, and the Club was formally Chartered in October 1916. Bedingfield undertook the role of Speaker-Finder, responsible for arranging speakers and other activities for the Club’s programme of weekly luncheon meetings. 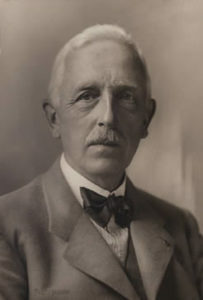 He was to hold this position for the Club’s first two decades alongside a succession of other Club and wider offices: Leicester Club President for 1917-18, Director, British Association of Rotary Clubs, 1918-25, District Governor 1923-24, District Secretary 1923-24, and District Treasurer 1923-25. However, a mere list of official positions held do not do justice to the key role Bedingfield had in developing Rotary in Britain and Ireland from just 13 Clubs in 1916 to more than 1850 Clubs with over 55,000 members by 2010. Bedingfield took the lead in developing the Rotary movement and establishing new Clubs not just in Leicestershire and adjacent areas, but also as far away as Lincoln, Cambridge, Norwich and even Ipswich, travelling many thousands of miles in the process. He also took a prominent role in developing the Leicester Club’s charitable activities beginning with support for Belgian and other refugees in Leicester during World War I and for boys and youths who had lost their fathers fighting in the War. Above all, it was Bedingfield who led the Rotary Club’s purchase in 1925 and management for the following six years of the 133 acres of Swithland Wood in Charnwood Forest – the first part of what is now the Bradgate Park country park to be saved for the public. Bedingfield’s fine calligraphic design survives today carved into the face of the old Great Quarry in Swithland Wood: “The Leicester Rotary Club Secured Swithland Wood as a National Heritage”. (With the donation of Bradgate Old Hall and its grounds for the public benefit by Charles Bennion the following year a separate Bradgate Park charitable trust was established to manage this, and in 1931 the Rotary Club agreed to merge its Swithand Woods charitable trust with that of Bradgate Park. Bedingfield died in Rugby in 1952, at the age of 81. Presidential Address: [reporting in detail on Bedingfield’s recent excavations at Leicester Abbey] Transactions LLPS vol. 32 (1931), pp. 5 – 24.